Michael is an habitual entrepreneur who quit his job in 2004 to start an affiliate marketing company. He left that company in 2010 to take a 2 year sabbatical RVing around the country. Since then he has been in the eCommerce arena on the way to building an 8-figure eCommerce company. Along the way he has been blogging, podcasting, and building an eCommerce community at EcomCrew. Welcome to the podcast Mike. Yeah, thanks so much for having me. I'm excited to do this. Yeah, not a problem. I was excited to have you on today. 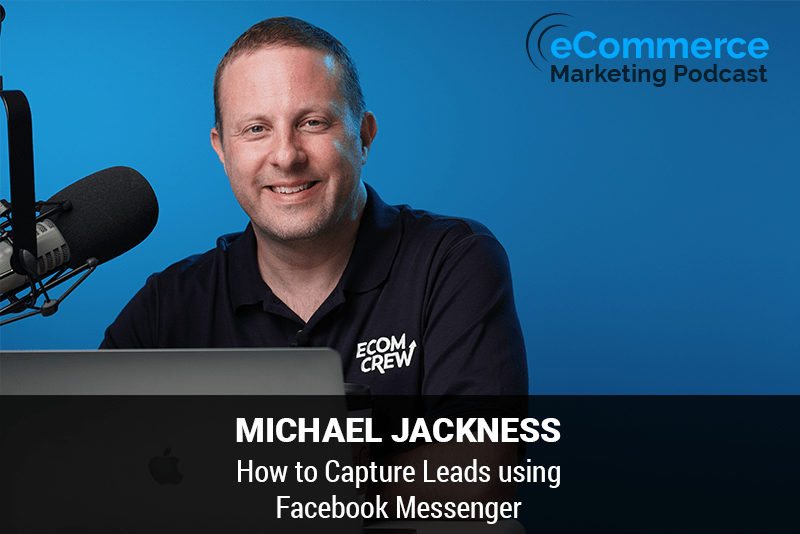 We're going to be talking about using Facebook messenger and how to pixel your customers. We're seeing a lot more of that these days on eCommerce sites. It seems like every every side I go to I'm seeing that and so I'm really interested in and having you break it down for us and and and letting our listeners know how they can take advantage of this opportunity. But before we get into that, why don't you tell us a little bit about your background? Grown and you know how you got into what you're doing today. Yeah, sure. I mean you are covered a lot of it there in the intro and thank you for that. Awesome intro, you know as I get older this your background thing that it gets to be a longer a longer story. So but yeah, it's but as you mentioned I've kind of been an entrepreneur my whole life. I started my own first my own company when I was 18 and ended up taking a corporate job. Eventually one of my clients hired me, but that only lasted for a few years until I kind of got the entrepreneurial itch again, and as you mentioned a 2004 I left that job. Been started in affiliate marketing company did that for for quite a while until I burn myself out which is a pretty typical thing for an entrepreneur to do when they are running full speed for six plus years and took a couple years off and start rving had a pretty good exit when I left the other company and invested all that money into in the keyword domain names always begin to in the domain names and one of the domain names I happen to purchase through all that along with a bunch of others was treadmill.com. Okay, and that's. Actually how I ended up eventually getting an e-commerce. It was a roundabout way, but I was you know, I had this affiliate marketing background. I was buying these domain names with the intent of eventually turning them into affiliate websites, which I had done with treadmill.com. And one day I was on a hike I can actually remember the exact moment when I kind of had this epiphany of you know, like I'm getting older like I think that you know, just just making money isn't necessarily the be-all-end-all part of what I want to be doing. I want to be adding value and not just necessarily bottom-feeding and I felt. As an affiliate marketer and that capacity. I certainly think there's a lot of. Really great affiliate marketers out there, but for what I was doing which was basically trying to rank for treadmill related keywords and unlike send somebody to Sports Authority or something to buy a treadmill right wasn't really adding a lot of value and I also always going to take umbrage with this eventually as well and they did several years later. They started playing whack-a-mole with these types of affiliate sites and luckily we had argue a changed our business model to this point at that point and decide one day on that hike that I was going to start an e-commerce site and a couple of months later. I. And that's all I got in the e-commerce. Okay. Yeah, that's that's awesome mean I can definitely understand what you're saying as far as you know being kind of held almost captive by Google and you know, you never want to be in the position where you're just you know, solely reliant on you know, one one stream of income and you know, if you have yeah eggs in one basket if you're just relying on the rankings from Google whether there. You know, it's the pay-per-click or whether it's just the organic listings because you just you just never know. They one small change to their algorithm could just you know could knock you out and then he'll know there's your business. And so yeah, you definitely have to diversify. Your efforts for sure marketing efforts for sure. So what's really funny about this is and I agree with you and but I've kind of started to determine if they're running all these different businesses over the years that this path is almost inevitable. We're kind of in this situation now, but with Amazon because a lot of our business is on amazon.com and no matter how hard we try it's been pretty difficult. So the change the balance there because they're growing quicker than the rest of the industry and so many people have their credit card already on file with. On that our cells continue to explode over there. So it seems like whatever business beginning to a no matter how hard we try to be, you know, 10% 10% 10% all spread out nice and even it doesn't end up that way. Unfortunately. Yeah, that is true. It's it just seems like these days with Amazon and what their how much money they have and what they're pouring into the their whole, you know platform it. They're not going anywhere for sure. So it's just we're going to have to learn how to play with Amazon. I think it's a. Make it for the for the foreseeable future here exactly took the words right out of my mouth. Thanks. Yeah, basically, you know, one thing of course that as we have talked to other guest on the podcast before about Amazon, but you know, there's definitely ways to to reach an audience without having to just be totally relying on Amazon and worried about you know, Amazon and people. Purchasing products or your competitors products on Amazon? And before we got before I approached you to do the podcast and you responded back. You mentioned a term that I don't know if I you coined or I've been really familiar with it's a known as the marketing Trifecta for those of us that aren't familiar with that. Why don't you tell us a little bit about what exactly the marketing trifecta? Yeah, it is a coin that term that I coined and I think it came from spending too much time in my childhood at the horse track or something. But what it is is I mean, it's three components of getting people on your Facebook Messenger list getting them pixel, but the Facebook pixel and getting their email address and if you can get all three of those data points from a customer, you can change your marketing strategy and trajectory from oh my gosh. Oh my gosh. Oh my gosh. I got to get a sale right now like before this. Some leaves and okay, maybe if they leave my sight I have an opportunity to hit him with a remarketing ad but if I don't get a cell right then and there like I've just wasted my money and you have like this immense pressure to convert somebody and that relatively short window of time versus if you are able to. Again, complete all three ports of the trifecta. Now you have an opportunity to communicate with them over a much longer period of time and stretch out this conversation and develop a relationship with them and hid them in multiple locations or multiple moods multiple bank account balance is multiple devices, etc, etc, and and have a much higher chance of eventually getting that person to become a customer Drew Drew. Yeah, definitely and. The thing there with with Facebook and I think why the engagement there is so great is because you know these days, you know more and more people are of course adopting and utilizing the Facebook Messenger on their phones. I know initially when I first came out, I guess there was a kind of a whole brouhaha about the security of it and then there was yeah people kept talking about all I'm not going to install that I think that for the most part that's gone away. Do you what do you what's your take on that and people kind of shying away from it because. It's a security thing or what do you what's your take on? Yeah, I mean it seems like especially I guess in the younger more millennial generation people don't even care anymore. You hear about these security things just like, you know us older people like or a little bit more private and Protect One understand the we want to protect our information but it seems like that isn't as big of a concern number one. Number two people forget about things relatively quickly and I think we're definitely past that and number three. This is already like just ubiquitous and it's really difficult. To supplant something that's installed on hundreds of millions of devices worldwide maybe even over a billion. It's here to stay and with the United States. The adoption rate is just it's way too high for for something else to come along and like knock it off the pedestal it just thinking how hard is it to get your grandma to like get the Facebook account then like get get the the Facebook Messenger account to begin with and it's. You have a certain portion of population can switch quickly, but the majority of the population won't and if you don't have all your family and friends on the same platform, then you're probably not going to switch either. So it's going to be very difficult from here for Facebook Messenger to become a relevant. It can happen. I mean things have happened in the course of the world, but if you look statistically like this is pretty much cemented at this point. Yeah that that is totally true. And with all of these adoption rates that it's that it's getting the Facebook. Injure and you know more people utilizing it more people getting on Facebook woman. Why do you think the engagement because you see so many businesses these days where you see the little Facebook messenger icon on the bottom where they have that on. Contact page or whether they even have it on their home page. Why do you see the engagement with that being so much higher than than the engagement with some other types of applications or support types of applications, but there's a few reasons. I think the other types of communication the primary went out comes the my phone report on my mind is email and there's fatigue like with anything in technology as. This great thing comes along eventually it gets saturated and people just get fatigued with it. Like for me emails like my Nemesis like I just met people like email me on a daily basis. I can't get to inbox zero like no matter how hard I try. It's brutal, right? So Facebook Messenger is like. Like new and fresh way to like communicate with people that eventually it'll Road and it'll become you know, the same the same feelings. I think that people have with email but for right now it's different and a lot of it I think is also because like the ability like to have like this instantaneous conversation have a more personal conversation where you know a lot of and obviously there's an automated component that you can have with Facebook Messenger, but the way that we use it were trying to communicate with our customers and build a relationship and actually have the. T2 to interact with them and you know on a psychological profile like being able to have even one sentence of a real human on the other side communicating with them is going to increase like the brand Equity they have with that business exponentially. So it does take extra time and effort on our part, but the relationship we can build with somebody is pretty powerful from that, right? That is true. And it's I guess you could say it the engagement there. It's similar to the live chat. Like you said people know. Typically, it's a live person. I know you can create the Bots that have the auto responses but a lot of times of course, I see companies. They're trying to directly communicate with people and and engage with them right there and just the fact that it's a live person is something. That people are pulled to more so because they know you know, they maybe they have a quick question or they just want to ask something directly and they don't want to necessarily pick up the phone and a lot of times especially these days companies are shying away from offering any any type or any level of a phone support So, I think this is a good. Good alternative for that, you know and I think I just I'm sorry just real quick. I think it's like a natural progression as well from other Technologies. You think of like AOL Instant Messenger back in the day, you know people you didn't ignore people that were instant messaging you because it's people that you know, typically and family and friends and then like, I think the next Evolution was probably like SMS text messaging which we still again. You don't ignore text messages because they're people that you typically. Want to communicate with and now you Facebook Messenger is a way to combine. Basically SMS text messaging with the businesses being able to also get in on that game as well right in the early days again. It'll be good. I think eventually people will get irritated with it over many years. But yeah, I look at how we chat is developed in China and a lot of Asia. And typically those countries are years ahead of us between two to five years ahead of us and the technology realm and I spend a lot of time in China because we import a lot of our goods from China. Usually they're about two months a year. And so I can see like how ubiquitous WeChat is over there and it's hard to imagine a situation where that doesn't eventually happen here over the next couple years. Yeah, that is so true things. Definitely eventually Trickle. Trickle over here, you know, they are usually first but then we kind of are not too far behind now, you know most businesses these days, of course have some type of subscriber. List on their site where they're getting people to subscribe whether they want to send them promotional information or they want to send them educational information via their email list. Do you think people are more opt to actually provide an email address through Facebook Messenger rather than just a standard, you know email list popped in whether it's a pop-up or just other some other type of Engagement. It's hard to say, but I think actually I think that probably triggers people wanting to give their email address more than anything. Having what? I call a no-brainer like compelling offer some if you if your first point of contact and a Facebook ad or on your website or whatever. It might be is something that people can't wait to like type there. They. I could type it in fashion off basically because like what you're offering them is so good and you know, so like I think where people go wrong. Is there the typical eCommerce sites like the pop-up is for like a newsletter or you know, a we Leo thing to went up when a prize it's nothing that's all that exciting the types of ads and offers that we hit people with our free downloadable content, especially with a brand like are coloring brand which we can do the type of thing where we can provide them. A download that actually has a monetary value if they were to go purchase it. So if you can come up with something like a free plus shipping offer or downloadable content or a lead Magnet or something that actually has value to the majority of the people that are coming to your site or looking at your ads. It actually becomes quite easy to get them to want to give you their address and I'm not sure that it matters if it's a landing page or directly in Facebook Messenger. I haven't really seen the rates for that change much for us based on the. More so on the offer itself. Gotcha. Gotcha. Yeah. I was just curious about that if people kind of felt differently or more comfortable doing it through the through the Facebook as opposed to just any other opt-in. Yeah, I'll be I'll be interested to see if there's any company that had any any particular analytics on that or any specific data, you know, like you said, I think a lot of it definitely does go down to the actual deal and what it is regardless of. Of how you're getting people to opt-in. It's just it really good goes down to do you have something enticing enough for them to you know to give up their email? Yeah, and you know, of course once you do get their email and people are in. Whatever type of marketing funnel that you have, especially of course, if you're using Facebook Messenger, how do you build a relationship through long-term marketing? Is there specific tactics that you're familiar with? Yeah. I mean, we basically take the same approach here as we as I would in real life and you know its first it streetlight was like I like to be treated. I would never ask someone to do something that I wouldn't that would irritate me if they ask me to do right so you can you first meet somebody as all these people out there in the world when you first meet them the first thing that's out of their mouth is you know, how can you help them basically, and that's a big turn-off and that's how. The majority of not only e-commerce companies, but just anybody that's selling anything online approaches approaches things. It just like here's this product come by at here's a service or course or whatever come by and they don't put any effort into developing a relationship first and so this is something that. Because the technology has changed to allow us to do that. That's how we've gone about doing it. So again, we were offering some sort of value first. We're asking them to sign up for something for free get these free. Coloring pages downloaded to your computer print them out and enjoy them the years the to keep your free and we're going to send you free drawings over a couple month period of time like every other day kind of thing at the same time. We'll also send you like here's some tips and tricks on how to color how to blend with your colored pencils or how to shade with markers or these types of things and we'll share Community photos and things that people submitted and try to convince them that also send in their they are art working start to kind of get this community feel. And in presence and everything kind of going along with it, right and then by time we hit them up with this new product has launched email or it's Mother's Day sale or it's a Black Friday sale. Their psyche is completely different because we spent all this time developing this relationship with them. We've spent all this time. Training them basically to look forward to seeing Communications from us rather than just like rolling their eyes and immediately throwing in a trash can so this helps with our email deliverability rate. It helps with the stickiness that we have with our customers. And you know again when the time is right for them instead of instead of trying to stick a square peg in a round hole when they're ready. They'll buy, you know, right, you know, it allows you to stretch out the cell cycle because. Facebook ad most of the advertising that happens in the world today is Interruption based marketing. So you people are not looking for whatever the hell it is that you're selling right now, right? I may just like leave me alone kind of thing. So if you can develop that relationship and be there at the moment when they are looking for you that's a much more powerful thing because you can when they're on Amazon typing in gel pens for coloring like that's an easy very easy time to get a sale but. When it's a Facebook ad it's a lot more difficult. Yeah. Yeah, definitely and I think what you said early on was something that definitely stuck out and it just kind of goes to common sense. As far as people are only going to be so receptive if you're just constantly. You know asking him for something ask him to do something ask him to take a look at your product your service and and by and by by by you know, just like if you have a friend that's always calling you a ring the doorbell and asking for something, you know, eventually you're going to stop answering. You know, it's like the friend that always wants to borrow money. Yeah, just like you don't want to pick up the phone for him anymore. He says this is kind of Common Sense. And so the same thing does apply for these customers that you get or these potential customers that you get in your in your funnel the term inbound marketing, which was of course. And by HubSpot is really very critical these days and that businesses need to be mindful of inbound marketing is the fact that your your marketing the other way around you're providing. All of these potential customers that are in your funnel with with valuable information like you said in your case resources about products how to use certain products may be information about a particular Niche that you're in and you know, you're not even asking them for anything. You're just you're trying to provide value to them and you're not you're not really. Thinking about a direct sale, then of course cell or cell eventually happen because you're providing them with this information. They're going to come to your site. They're going to come to your resource page or visit your YouTube channel, and they're going to find their way to your site, but it's just you're not you're not aggressively and immediately just constantly asking for the sale sale sale, and that's that's something that businesses really need to take more advantage of it. Yeah, I mean I couldn't agree more. I mean I'm I guess partially for personal reasons. I'm on a bunch of email list that I've subscribed to and also for business reasons where I've done research on competitors and I'm on their list and just seeing what people are sending out an email marketing land and I would say that way north of 95% of emails are all just propaganda. It's all brand new product or here's my sale come by for me and very little like here's some cool information that might help you in your life. Or make your life better. Yeah, very few people take the time to do that. So I think that that's one thing that that we've been able to excel at and it's really helped our company. Okay? Yeah, that's that's awesome. And I totally hear what you say. Unfortunately the the fact that you know inbound marketing is it's a lot more effective and it's out there the knowledge is out there. But unfortunately this businesses still are just kind of kind of going through the old ways of just trying to just constantly ask yourself so cell and then those go. Those emails are just going straight straight to people's trash and they're not just the really just not that effective at all. And I was one thing I wanted to kind of circle back on it and get back on. You mentioned at the very beginning part of the marketing Trifecta was, you know, getting these customers or potential customers pixeled with regards to Facebook. Why don't you explain for those audience listeners that are familiar with that and getting people Facebook pixel explain to us a little bit about what exactly that is and how that can benefit. Yeah, so once you have someone in your pixeled audience, you can basically follow them around the internet. So extra a little bit spooky and I think we've all kind of gotten used to this now, but this is what allows when you go to a website and five minutes later when you're on Facebook you see an ad for that website that's what allows us to happen. So the pixel is just a little piece of code that goes on your website and then it allows you to basically sync up with Facebook and communicate two ways of what people that are face. Users are doing on your website, but you don't know at a granular level level like who it is individually, you don't get you don't get the personal data from them. But you know that someone just visited your website. They just visited this particular page. So you could advertise that particular product to them or you could if they hit the cart and abandon their car you could advertise a coupon code or something to them if they purchased an item from you in the past you could advertise a like product to them. So there's all these different things. You can do you can track people knowing that they were on your site visited certain things purchase certain things took certain actions. It's amazing day to have and if you think about ways that you can utilize it like like we have it's really been one of the things that's become the bread and butter of our advertising campaigns like the Evergreen Thai pads that we that we continuously run that get the highest return on ad spend right and the whole following and then the target like you said at the beginning there's a little bit spooky. I think these days people are you know, they're used to it these days because I think people kind of realize that after they visit a particular site and then they go to Facebook. They start seeing ads. I mean they kind of know what's happening. I think maybe at the beginning when this first started people are hey, wait a minute. I know I was interested in buying it. Did they read my mind but not think you know, people are really kind of understand what's happening these days and that's really I think a pretty effective way to for companies to. To Brand, you know, they may not get a whole lot of direct sales they may or may not but for somebody to visit their site and then go back to Facebook and then start seeing their ads. It's just a way to really touch Point whether it's just a visual touch point with that user regardless if they click the link or not. It's just a way to take on a stay in front of that potential customer. Yeah exactly up. Yeah, you know with with regards to all three of these things, you know getting getting pixel. Using the Facebook Messenger getting people opting in to your email mailing list. What are what particular tools are really required really, you know that make all of this happen or is there any that you can recommend? Yes, we use many chat build our Facebook Messenger list. And many China is a pretty much the equivalent of like a MailChimp or activecampaign. Klaviyo. It did the to the email space. You need a tool to be able to send broadcast messages out to your many chatter your Facebook Messenger list and get people on your list and have the bot technology or functionality behind the scenes happening. So that's many chat. There are other tools out there that do this as well. We just ended up with many chat because they were one of the early ones out there and it does everything we've ever wanted to do and we've never once thought oh man, like I wish many child could do X Y and Z they are pretty much at the Forefront and I believe that the biggest as well so and they're also really reasonable that you can have a free account for quite a while and if you upgrade to Pro, it's like something like 10 bucks a month to start with when you're first getting started. So it's economical to get started. Okay, and then they all were told that we use because we're an e-commerce is klaviyo. Claudio's kind of regarded as the best of breed email marketing package and the functionality that I has two segments and synchronize segments that you have in your email list into Facebook audience is as really powerful. So if you take advantage of the advanced functionality. That Claudio has because it is expensive it becomes very much worth it. If you weren't going to take advantage of some of the things that it does and the other thing I would say is if you don't have an e-commerce brand that has a high lifetime value or high frequency of additional purchases from customers. It might not be worth it as much but for brand like color it were. 50% of our Revenue comes from email marketing because we're able to send strategic emails to get people to repurchase some of the items that they might have consumed. It works really. Well. Yeah, that's that's awful. I've heard a lot about klaviyo marketing experts in the industry. They they are constantly pointing that way and I've taken a look at it and kind of used it and played around with it internally on our in here because we've been looking at ways in which we can kind of integrate into into that software and make it available to. Customers that have that software to be able to use ourselves software. So I know it's really highly regarded and there's a lot you can do with it. But yeah there there are a lot of tools out there like that. That's that's the one thing that I'm wearing the day and age now that with all of these SAS Solutions. It really makes high functionality really at at Arm's Reach to really literally any business because. Most of these Solutions are pretty affordable, you know a small monthly cost you can you can get some really powerful Tools in a lot of functionality out there where as you know, kind of back in the day, you know, I think both of us have kind of been around for a minute but back in the day, you know, early 2000s and and and such there was tools but there weren't as many and the price points were we're really. At a point where they're not made it not accessible for small businesses and you need you know, almost a development team just to compete to configure them. So things are different these days. Agreed for sure. Yeah, and and so Michael. Yeah, I really appreciate you coming on to the the e-commerce marketing podcast. Like I said, this was an area that really hadn't touched on before and appreciate your insight into the what you coined the marketing Trifecta getting people using Facebook messenger and reaching them that way also pixel in them and getting them opting in and marketing them through those different channels. So that was that was awesome. But I want to go ahead and close things out with the final question. I like to ask all of. Guest now and and that is what is one thing that our audience members would be surprised to know about. That's an interesting one. I think the first thing would have come to mind is that IR vide for a couple years, but you hit that on the on the intro. So I'll throw another one out of self-deprecating one. I used to be terrified to do podcasts and to speak in public and it was something I had I had to work on and. It's probably hard to believe these days because it seems like it's so natural but it was definitely something that when I first had to do some public talks there's a lot of people that talk about they'd rather go to the dentist or do these other awful things and then get up in front of a crowd and speak. So it was something I had to work out. I want to Toastmasters for quite a while and practiced doing bill doing talks until I got comfortable with it. But it kind of proves that if you put your mind anything you can do it. Right right, I hear you and yeah appreciate you sharing that I know public speaking it is. Is in even just going on podcasts even podcast where you're not, you know directly sitting next to somebody it can be difficult and they do say that. Public speaking is really up there as far as the fears. I mean, some people are be less afraid of actually dying actually public speaking. I think that's what they say. No doubt. Yeah. I am and I want Total advocate for Toastmasters. I'm actually a member of the local Toastmasters Club. Nice in the Orlando area, and I've been a member of Toastmasters for Wow over six years or so now and I can't speak enough about Toastmasters. It's a great organization. So that's why you don't say right. That's right. I try to watch it. I try to watch it. It's not it's not easy. But Yeah, Toast Masters will help you eliminate a lot of those filler words and just make you overall better speaker. So for those listeners out there if you're interested in looking for a club it is a it is a global worldwide organization. They've got clubs and literally almost every major country. So you just need to go to Toastmasters dot-org and put in your address and you can see what clubs are near you so and it's cheap man. It's like this. It was something I forgot what I've actually not been going lately just because I felt like I kind of ran the course with that now that I've been doing so much podcasting so much public speaking. I get practice just naturally from that but when I was there was something like $25 a year or something really cheap. Yeah it is. It is very very cheap and for what you get in. And the power that it can really give you an Empower you it is a great resource for sure. Okay. Well great Michael will I like I said, once again, we appreciate you being here on the e-commerce marketing podcast and sharing that that's closing fact with us and if there's any listeners out there that want to get in touch with you. How do they do? Yeah, something we run on a podcast of our own e-comm crew e-comm CR ew, that's also a Blog and a website you come crew.com the best way to get ahold of me is just to email support e-comm crew.com. My assistant will forward that on to me and make sure that you get a hold of me. Yeah. It's a fun fun project that we've done over there for the last several years. Just blogging and podcasting about the entire. Journey of our e-commerce business and we also have some courses and other things up there as well. Okay grey that that sounds awesome. I'm sure our listeners will go ahead and check that out. I will actually do that myself. So yeah. Thanks again Michael and we appreciate you joining us. Of course. It was a lot of fun. I really appreciate the invite. Thanks a lot. Thank you for listening to the e-commerce marketing podcast. You need to get more feedback and reviews from your customers and improve your customer retention.